With a fusillade of hail! Brings the old hero-trees to the ground with a crash! Trampling, trampling, trampling, to overwhelm the shore!" Here’s a wild picture. Until last month’s unprecedented extreme weather conditions in Scotland, I would have said it seems a bit odd to be writing about wild Autumn weather in June but hey ho... 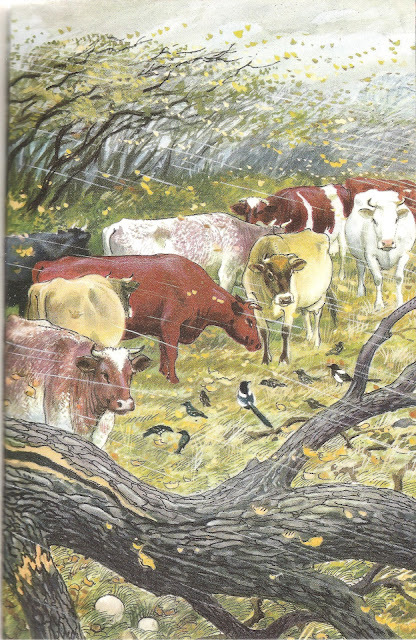 Here, a herd of young cows are sheltering behind a high hedge from a gale and lashing rain. Some starlings and magpies are sheltering as best they can behind the cattle. Growing under a fallen, broken tree, there are some puffballs. The only part of this scene that you couldn’t have found here last week was the puffballs – it’s a bit early for those in June! But hey, this is supposed to be a picture from Autumn. In fact, as far as the theme of these posts goes, comparing our natural history today with that displayed in paintings from 50 years ago, I don’t have much to say for this one. I’ve already covered starlings here and magpies here and, as I’ve said elsewhere in these Autumn posts, we actually don’t have good information on the changes in the distribution of many of our native fungi over time, even the relatively large ones like puffballs. Having lived in the Stirling area for 22 years, I’ve seen many little puffballs around here, but never a giant puffball, the edible (in fact, gourmet) giant puffball beloved of gourmands, and delicious when sliced and fried; until last Autumn that is, when O and I were walking near Dunblane and found the shattered and largely decomposed remains of a giant puffball, but which was still capable of producing clouds of spores. So we took some pieces and scattered them along the edge of the field we found it in and, from late summer, we will start checking for signs of growth, just in case! You're right SNB it doesn't seem strange at all to be talking about Autumn at this time of yoear somehow. nice to see you posting again. Hopefully that means things are a bit less hectic. Maybe one day you would be able to join your wee brother and I for a drink and a chat.